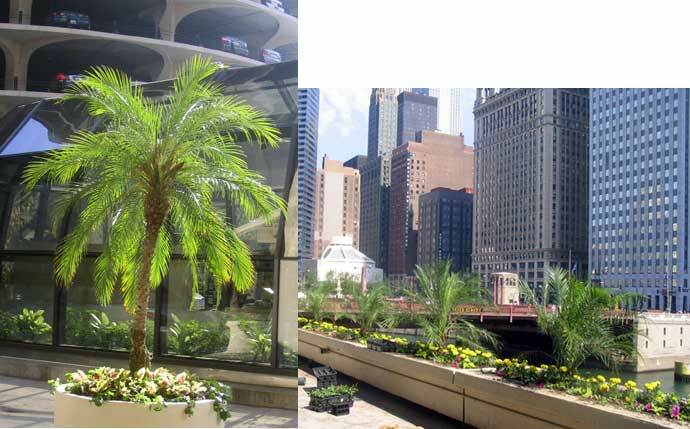 Palms Trees are usually not the first thing you associate with Chicago. Bertrand Goldberg's iconic Marina City complex somehow got along without them for for the first several decades of its existence, but for the past few years, one of the sure signs of summer has been the planting of the palm trees all along its raised plaza. Fittingly, it was a May week of record heat that saw the ficus's of spring being pulled from the planters and the toy-pony-sized palms put in their place. It's a little goofy, to be sure, but why not? Maybe it's a homage to the Corbusian, sunny Mediterranean influences found in Goldberg's works. (The curving forms of the theater that's now the House of Blues channels Corbu's Notre Dame du Haut at Ronchamp, if only Ronchamp had a souvenir shop in its side chapel.) Having the palm trees back is a quirky treat. Who knows? 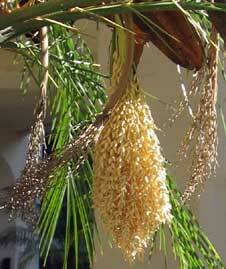 If we're lucky, maybe they'll even break out into seed pods again this year. 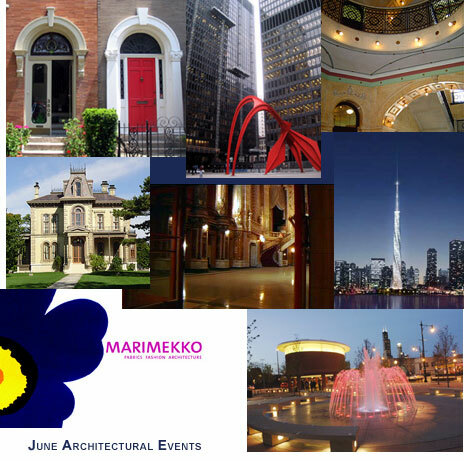 The summer slowdown may be underway, but you can barely tell it by the wide range of choices on the June calendar of Chicago architectural events. The 25th Annual State Preservation Conference takes place June 8-10 in Bloomington/Normal. Closer to home, there's the debut of two new documentaries - one on the historic Uptown Theater at the recently reopened Portage Theater, and Sydney Pollack's portrait of Frank Gehry at the Music Box. Lectures include Chris Carley talking about his Fordham Spire, designed by Santiago Calatrava, at a Friends of Downtown event at the Cultural Center, and Lyman Shepard discussing Frank Lloyd Wright at a CAF's lunchtime lecture. The Structural Engineers Association of Illinois holds its annual banquet, a new exhibit on Marimekko fabrics opens at Crown Hall, and James Turrell's UIC Skyspace has its formal dedication. All that and a lot more - preview the June calendar here. Rapson's Guthrie Theater - trashworthy? Docomomo Midwest is passing the word on a last-minute petition drive to save Ralph Rapson's modernist Guthrie Theater in Minneapolis, which the company abandoned earlier month as it moves on to a new $125,000,000 complex along the Mississippi River. The Rapson building is scheduled to be demolished later this year for an expansion of the museum's current 12 acre sculpture garden. Rapson, at age 91 still active at Ralph Rapson and Associates, was on hand for the final performance, and has testified in support of preserving the theater. The 11th-hour drive is being spearheaded by savetheguthrie.org. You can sign the petition on-line at the their website (as Preservation Chicago's Jonathan Fine and architectural historian Ward Miller, Director of the Richard Nickel Committee, did just today), as well as leave your comments. The site also has a wealth of information and links on both the Guthrie and Rapson, as well as a sampling of often caustic emails from people deriding the effort. Major alterations have vandalized Rapson's design, most significantly in 1974, when the original cubist facade was removed. The Walker's PR man, Phillips Bahar, was quoted in an article in the Twin Cities Finance and Commerce as saying "People need to understand that there have been major changes to it. That's when the historic value of the building changed." Which may appear to makes sense, until you recast how that sentiment would sound coming out of the mouth of a museum curator: "Well, being a genuine Tiepolo, the painting certainly has historic value, but parts of the canvas have been painted over by later hands, so we've decided the only thing to do is not to waste time and money trying to uncover its original glory but just pitch it in the trash." 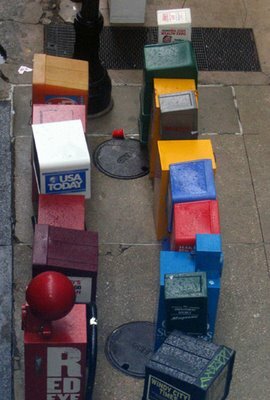 Former Chicago Sun-Time's architectural critic Lee Bey has a new website, Lee Bey: the urban observer, that both lets you keep track of Bey's activities, and offers up a "Chicago Building of the Day", usually with one of Bey's own photographs. On Monday, May 22nd, that building was Chicago classic Marina City, but what makes the site potentially more interesting is when the building is a lesser-known, classic, such as May 19th's Stranger's Home M.B.C. church, a survivor that was there before the creation of the now infamous Cabrini-Green public housing project on Chicago's near north side, and now survives it as the area is becoming increasingly gentrified. 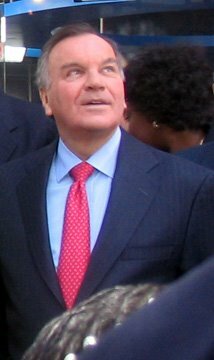 Bey served as Deputy Mayor to Richard M. Daley, and is currently director of media and governmental affairs for Skidmore, Owings and Merrill. Lets hope the urban observer puts Bey's distinctive, refreshing take on Chicago architecture back into more frequent circulation. Chicago's Richard M. Daley is among three mayors cosponsoring Resolution 50, Adopting the "2030 Challenge" for City Buildings (in pdf format) to be presented for approval at the U.S. Conference of Mayors conclave in Las Vegas June 2 though 6. The resolution mandates that all new public buildings will be "carbon neutral" -not using any fossil fuels - by the year 2030. It lays out a timeline for this goal to be met, with buildings to be 60% fossil fuel free by 2010, (less than four years away), 70% free in 2015, 80% in 2020 and 90% in 2020. The resolution cites a recent study by Lawrence Berkeley National Laboratory that pegs the benefits of green design at $50.00 to $70.00 per square foot, more than 10 times of cost of making a structure green, with initial construction costs representing only 20-30% of a building's entire cost over a 30 to 40 year life cycle. For renovated buildings, the Resolution sets a goal that doubles the fossil fuel reduction standards of the U.S. Department of Energy. According to the Architecture 2030 newsletter from green architect Edward Mazria, "Buildings account for an estimated 48% of all green house emissions. " The National Government Advocacy Team of the American Institute of Architects is actively lobbying for the resolution's passage. Mazria's newsletters points to pr/lobbying material such as suggested talking points on the resolution, a template for a letter to a mayor urging support, as well a draft of a op-ed submission. (All in Microsoft Word format) Since the U.S. Conference of Mayors includes cities with over 30,000 in population, in Illinois that would mean not only Chicago and Rockford, but suburbs from Schaumburg to Cicero, and dozens in between. 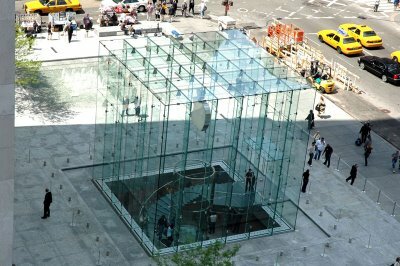 Apple Computer's new 59th street store in Manhattan, across the street from the historic Plaza Hotel, opens Friday, and judging just from the photographs, it's a triumph of both marketing and architecture. Designed by the firm's architects, Bohlin, Cywinski, Jackson, which also did Apple's Michigan Avenue Chicago flagship, the 32-foot-square glass cube that marks the entrance of the store does Mies van der Rohe's desire for an architecture of "almost nothing" proud., creating one of the more distinctive retail spaces of the new century. Its fabric of individual, super-transparent glass panels are set in thin posts and beams that also appear to be made of glass. The structure holding the thing together seems to have disappeared - the cube is so light it almost looks like it was made out of cellophane. 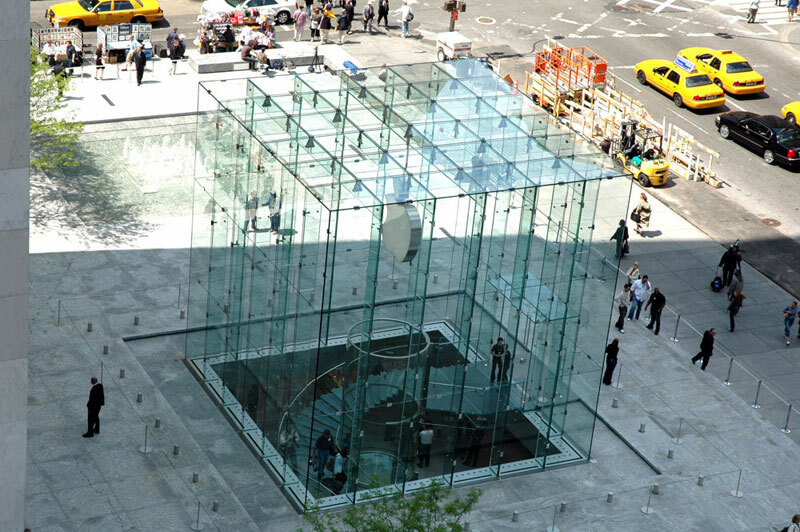 There's a floating glass staircase leading down to the actual retail space below street level, wrapping around a single-piston glass elevator. Here's some photos on Gearlog, and a detailed article on the store from the New York Sun. The store was wrapped in black during construction, and here's photos of its "unpeeling" from ifostore. The photo reproduced here is from boingboing and was taken by literary agent John Brockman. 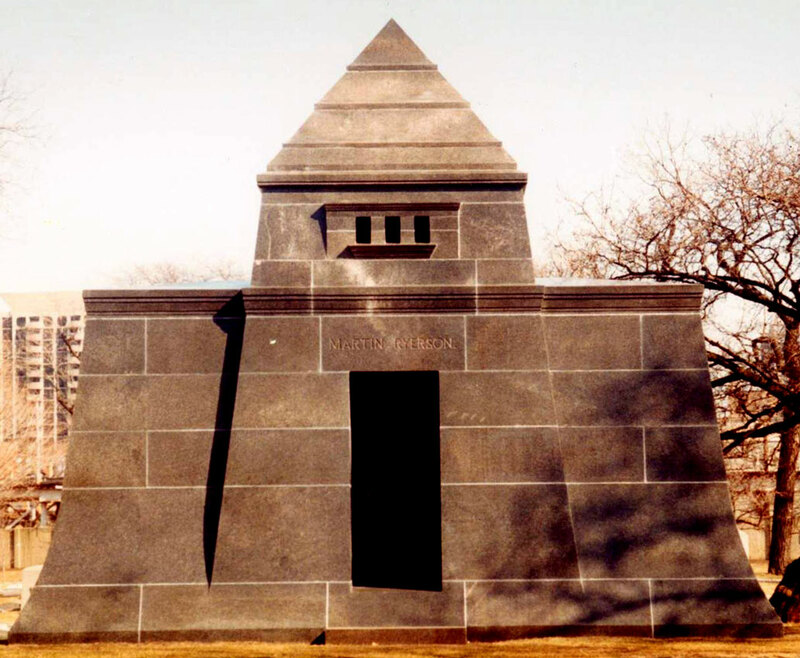 The Society of Architectural Historians has sent out a notice that the registration period has been extended to June 1st for two ambitious tours of the surviving works of architect Sullivan, who was born 150 years ago this coming September 3rd. 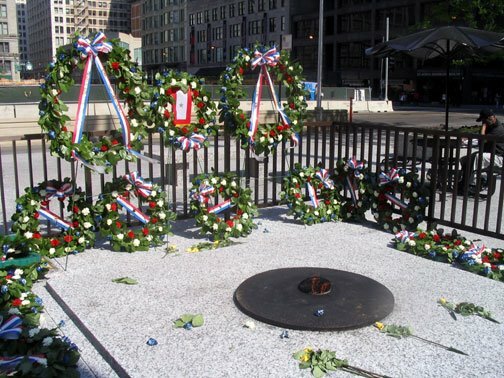 Part one, taking place June 18th and 19th, will tour Sullivan's works in Chicago, including as the Auditorium Building, the Gage Group, the Jeweler’s Building, the recently restored Schlesinger and Mayer (Carson, Pirie, Scott) Store, tombs in Graceland Cemetery, Krause Music Store, Charnley-Persky House and Holy Trinity Orthodox Cathedral. 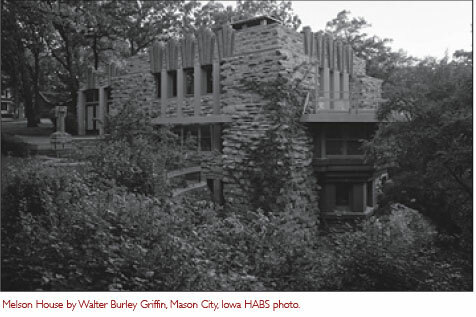 Part two, taking place June 19th through 25th, offers an extraordinary six day tour of works in Iowa, Minnesota and Wisconsin, which will allow participants a rare view not only of Sullivan's banks in Owatonna and Grinell and Clinton, Iowa, plus works by Frank Lloyd Wright (Taliesin East), Walter Burley Griffin's Rock Crest/Rock Glen community, and Santiago Calatrava's spectacular new addition to the Milwaukee Art Museum. The Tours will led by Sullivan scholar H. Allen Brooks. The cost for the 2-day Chicago leg is $195.00, for the six-day out-of-state tour $1495, double occupancy, or $1795, single. A full itinerary and registration form can be found online, in Adobe Acrobat format. For additional information, call SAH Manger of Meetings, Tours and Fellowships, Kathy Sturm at 312/573.1365 or by email. 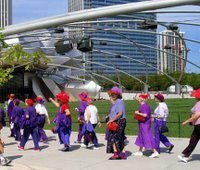 Beginning in late August, the Chicago History Museum (formerly the Chicago Historical Society) is co-ordinating a month-long series of events, including the participation of most of the city's major cultural institutions, both honoring Sullivan and exploring his life, works, and continuing influence. Some late additions to the calendar. Todd Eberle: Architectural Abstractions, is one of two new architectural photography exhibitions that open this Saturday, the 20th. Eberle's show opens at the Art Institute, while also opening on Saturday at the Museum of Contemporary Art is Catherine Opie: Chicago (American Cities), a series of photographs of Chicago by the L.A.-based photographer. Opie and Wolfgang Tillmans will discuss their work today, Thursday, at 6:30 P.M. at the MCA's auditorium. 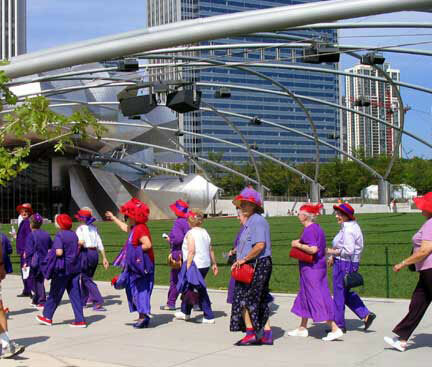 Also on Saturday, beginning at 9;00 A.M., the Pritzker Pavilion at Millennium Park will be the site for its first-ever graduation, for the the School of the Art Institute of Chicago. Graphic artist and futurist Bruce Mau will be the featured speaker. The pavilion, itself will be reserved for the 800 graduates and their guests, but you may still be able to catch his speech from the great lawn. This September, Mau's own exhibition, Massive Change: The Future of Global Design, finally will wend its way to Chicago after several years at other museums at the Museum of Contemporary Art. Finally, this years Great Chicago Places and Spaces kicks off Friday evening with a 6:00 conversation at the Chase Theater at 10 South Dearborn featuring Lee Bey, IIT's Donna Robertson and Jaime Lerner, former Mayor of Curitiba, Brazil. Over the weekend, Great Chicago Places will offer over 200 tours of Chicago architecture. It was not through his tutelage as a partner to Rem Koolhaas, but by marriage that architect Joshua Ramus became a Prince. (He added his wife's last name to his own when he was married two years ago.) Now, according to a report yesterday in the Dallas Morning News and an extended story in Sunday's New York Times, Prince-Ramus has flown the Koolhaas coop, taking AMO, the sister American firm to Koolhaas's OMA, and its 35 architects with him. 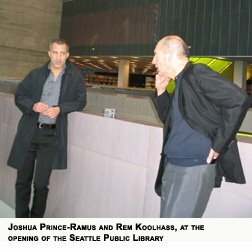 Prince-Ramus was a key player in the design of the very favorably received Seattle Public Library, and his new firm, Ramus Elia Architects will bring AMO's current projects, including the Wyly Theater in Dallas, and the recently announced Museum Plaza megaproject in Louisville, to conclusion. Ramus Elia Architects has announced it will be represented by the acronym REX, taking Ramus from Prince to King in a single stroke. Officials in both Dallas and Louisville were quick to insist that their projects bore the genuine Koolhaas stamp while at the same time professing a high level of comfort with Prince-Ramus. Issues of authorship are often a puzzle. Was Charnley House a work of Louis Sullivan or of his head draftsman, Frank Lloyd Wright? Sullivan may have harbored a bit of jealousy towards his wildly talented prodigy, summarily dismissing him when he discovered Wright was taking on outside projects. It doesn't work that way today. "The issue becomes, how should the work be credited?" 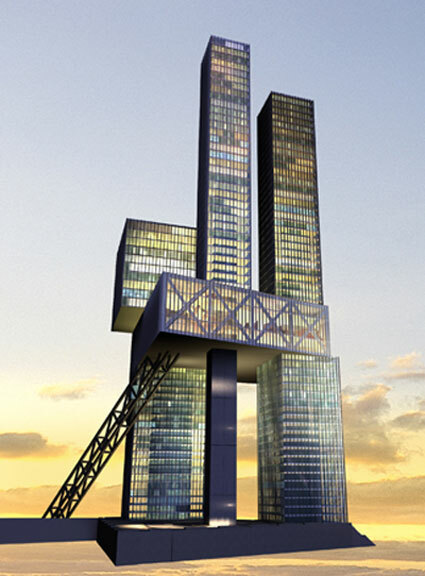 Times reporter Robin Pogrebin quotes Koolhaas as saying. "On his part there is interest in sole credit for the work because he is sole author of the work. My interest is to clarify, so we don't get a blur between what is the work of Joshua Ramus and what is the work of O.M.A." In that light, it will be interesting to be see, if Koolhaas continues to pursue U.S. projects, how different they will look from those on which Prince-Ramus was the key U.S. partner, or, on the other hand, what new commisions from REX be like now that they're free of the Koolhaasian yoke. Tag Day for an Endangered Kenilworth? 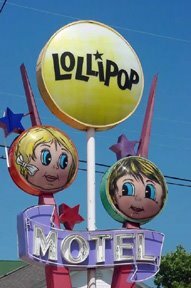 What do Doo Wop Motels and the Chicago suburb of Kenilworth have in common? 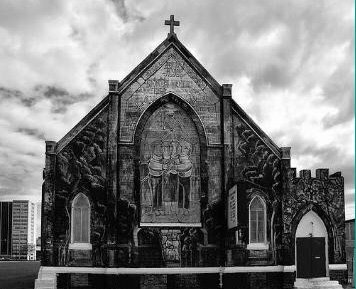 They've both just been named by the National Trust for Historic Preservation to its 2006 list of America's 11 Most Endangered Historic Places. Kenilworth may often win out as the country's wealthiest suburb, as in a 2004 survey by OnBoard LLC, but it's suffering from a "really big house gap", ranking a pathetic 88th in Forbes Magazine's 2006 list of America's most expensive zip codes, with the media home sale price an anemic $1,075,000. Clearly, Kenilworth has a lot of catching up to do, and, according to the Trust, it's "under siege" by MacMansion mania, with nearly two dozen teardowns in just the last three years. 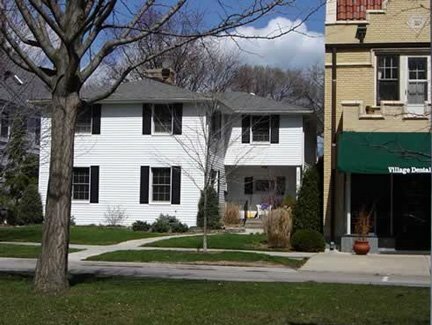 Long-time resident George Maher tops the list of historic Chicago architects who have built in Kenilworth, accounting for over 40 of the suburb's 830 homes. Daniel Burnham also did homes there and Jens Jensen laid out a number of its landscapes. The Trust website includes a number of resources "for Protecting Historic Neighborhoods from Teardowns". While three photographs on the website document how out of scale some of the new projects are with the rest of the community, the Trust offers little in the way of specifics to prove that important architecture has been lost. The demolished building in the photo shown above doesn't look much different than a higher end house you'd find anywhere else, nor does the commercial building next to it. Every effort should be made to save structures of true architectural distinction, but if the residents of the richest suburb in America want to slum up their own back yard with big bad outcroppings of ostentation, it's pretty much a self-inflicted wound - who are we to say no? Me, I'm a lot more concerned about the Doo Wop Motels. 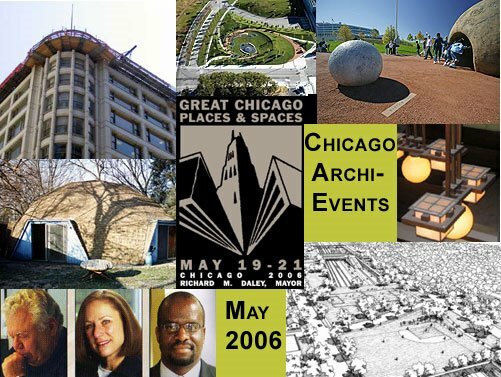 Repeat's May calendar of Chicago architectural events has been updated to include additional events such as this Friday's exhibition of student work at the School of Architecture at IIT, the Urban Land Institute's symposium, Is Chicago Commercial Real Estate Heading Towards the Perfect Storm? (I'm frightened already), and Catherine Opie: Chicago (American Cities), an exhibition of Opie's photographs of our city at MCA, with a personal appearance on May 18th. Finally, the Graham Foundation's exhibition, Golconde: The Introduction of Modernism in India, has been extended through May 25th. This week on Monday the 8th, the Chicago Children's Museum will make a presentation before the Grant Park Advisory Council on its proposed move from Navy Pier to Grant Park. On Tuesday the 9th, Bernard Tschumi speaks Tuesday evening at Rubloff Hall under the sponsorship of the Architecture and Design Society of the Art Institute of Chicago, while at exactly the same time, Robert Wislow and Nancy Pacher will discuss Building Chicago - Before the Architect at ISpace for the Chicago Architectural Club. Check out all this week's events here. The conceits that: a. The project is supposed to be secret, b. the Iraqi people will see it as anything other than a enraging symbol of perpetual occupation - priceless. 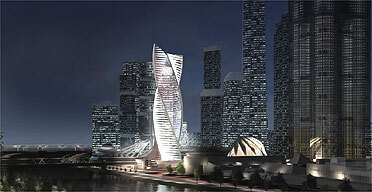 Two Bits - Calatrava in Chicago and now RMJM in Moscow? Hot on the heels of the drill-bit design of Santiago Calatrava's proposed Fordham Spire in Chicago, we receive word via ArchNewsNow and the Guardian newspaper of a proposal just approved for an another "drill bit" structure in Moscow, the 46 story City Palace, which RMJM architects prefers to call, according to the Guardian, "two ribbons wrapping around each other". It will stand adjacent to Norman Foster's proposed Moscow City Tower, which at 118 stories, would be the tallest building in Europe, which in this rendering posted on Emporis, looks like a far more elegant version of the mercifully deep-sixed proposal for a 2,000 foot Beitler Tower in Streeterville. Edinburgh's RMJM also built the late architect Enric Miralles new Scottish Parliament, which wound up costing 10 times its original estimate. Since Mr. Smith was responding to a post I made all the way back in January, which few people are probably looking at right now, I'm taking the liberty of reposting it here in its entirety, as he has some interesting things to say. 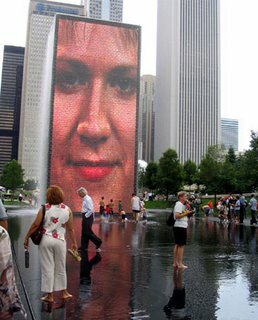 My original posting, AIA Award for Millennium Park Slights Uhlir, Plumps for SOM, talked about how I felt the AIA award slighted project director, architect Edward Uhlir, in favor of SOM, which created the original master plan for the park. 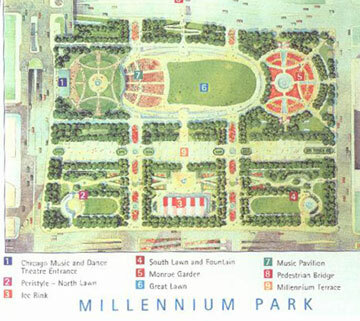 There's so much difference between that initial concept (one early rendering below), highly traditional and conventional, with the dramatically different Millennium Park that finally emerged that I still harbor doubts that SOM could really have been the most decisive agent of change behind that transformation. 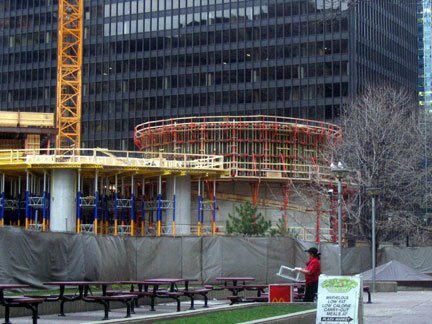 SOM's original plan was skillfully crafted, backward-looking (which is apparently exactly what the Daley administration was looking for at the time), and more than a little dull. The actual Millennium Park is anything but, and in this case the site plan was less a static map than a dynamically evolving contention between terrain and its features, and since Mr. Uhlir was the ringmaster of that sometimes almost anarchic process, I thought he deserved more credit than he got. Mr. Smith also has a very different recollection of the genesis of Frank Gehry's involvement. Ironically enough, Gehry's take on the story, given at an Art Institute symposium at the time of the park's opening was, itself, a response to still another version just given by the evening's moderator, no other than Edward Uhlir. "Ed Uhlir's story about how I got here," said Gehry, "is like the movie Rashomon. It didn't happen quite that way. Adrian Smith was doing the park, and he called me and asked if he would do a fish sculpture on either side of his proscenium . . .andd I said no, I don't do fish sculptures. I made some lamps that looked like fish. And that was it. didn't hear from him again, and I forgot all about it. And then these guys called and came out to see me, and before they came they said it was for Grant Park, and I said well I already told them I wouldn't do the fish sculptures, and they said, no, no, we've got something else. And they came and they said they wanted me to design this thing in the park, a bandshell. Then I said, aw, come on, I don't want to do a bandshell in the park. . . I said if you're going to do a music thing you've got to make it substantial . . . They said, oh, you can do that. I said, gee, that's great. They said, we'll even throw in the bridge if you want to do it. So I said, OK, that sounds good. " You don't have the story right on the Gehry fish thing. I asked him to do the Proscenium, not to do a fish. I asked him as an artist to get involved and he told me no because he is an architect and wanted to do more. I reported this back to the committee and the subject stalled for a while because there was a point when we were looking at covering the seating area and the proscenium design was up in the air. Then Cindy [Pritzker] called him and asked him if he would do it and he said he would. It was SOM that located and advocated for significant pieces of art to be placed in different sections of the park and we worked with John Bryan to establish "gifting" opportunities for the park. Anish Kapoor was selected as a sculptor by the arts committee which I was on. 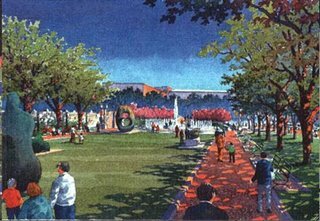 The landscaped garden was selected by the competition process which I was on, the oval seating area and the bandshell location was in our early master plan as were the terraces, promenade, Ice skating rink and fountain. Ed Uhlir did a great job of coordinating all of the diverse consultants and artists to get the job implemented but he wasn't the person who conceived the master plan. This is an award for Master Planning and Urban design, not architecture and as such Ed will be recognized as the clients representative, not its author. Things may be winding down a bit as we move towards summer, but there's still a full calendar of architecture related events in Chicago for May. At the enter is the annual Great Chicago Spaces and Places over the weekend of May 19th through 21st, which includes over 200 free tours led by celebrities (Geoffrey Baer and Bill Curtis) the architects of some of the city's newest buildings (John Ronan and James Goettsch), as well as inside looks from movers and shakers such as Millennium Park's Ed Uhlir and the Congress for New Urbanism's John Norquist. It all kicks off with a conversation with Jaime Lerner, former mayor of Curitiba, Brazil, IIT Dean or Architecture Donna Robertson and writer and critic Lee Bey. Architect Bernard Tschumi comes to the Art Institute on May 9th, and other topics range all the way from covering the Eisenhower Expressway in Oak Park, to Gunny Harboe talking at a CAF lunchtime lecture about restoring the cornice to Louis Sullivan's Carson Pirie Scott building. Check out all the events here.